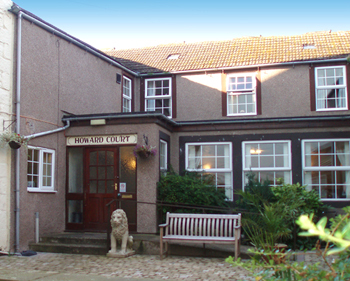 Howard Court Care Home has been running successfully for over twenty years under the continuous ownership of Mr Mike Dresser. It is now under joint ownership of Mr Mike Dresser and Mrs Jean Mason who is a qualified nurse. Howard Court Care Home was built into an old 17th century coaching inn and evidence of its former use can be seen with its 30" thick walls and low oak beams, exposed in one wing. The home was built in 1987 by Mr Mike Dresser and in 1993 extended to include a new wing with six en-suite bedrooms and an eight person passenger lift. We are situated only 20 yards from the town centre of Brampton with access via a private lane. We have a good sized, enclosed courtyard area with conservatory in which residents can enjoy sitting outside no matter what the weather brings.